Custom Full Color Bag Clips Personalized in Bulk. Promotional, Cheap. Bargain Prices for America. Union Made. 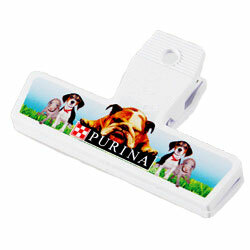 High quality, yet inexpensive promotional Full Color Bag Clips in bulk, custom imprinted in full color. Free artwork design. American clients pay no taxes. Product Size: 4-1/4" x 2-5/8""